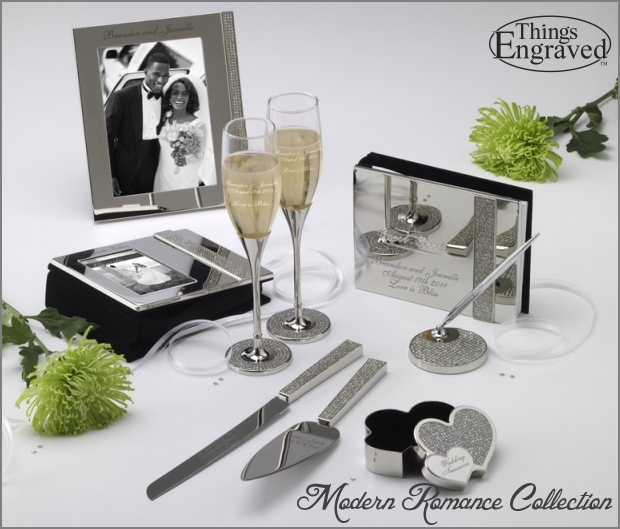 Wedding Collections | Things Engraved Inc. 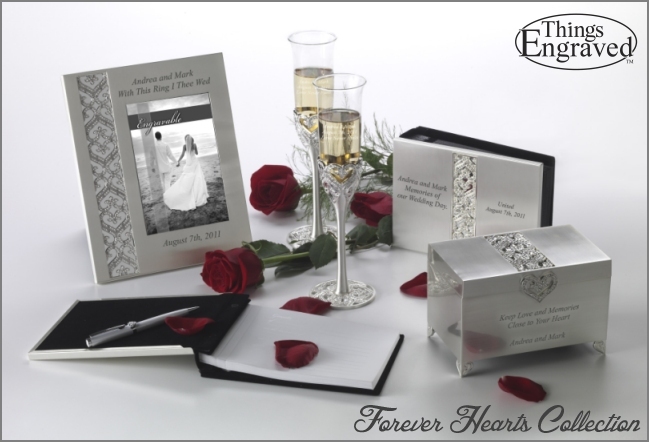 Wedding collections includes things like wedding flutes, guest books, pens, frames, photo albums, cake knives and servers, and keep-sake boxes, all in a matching set. 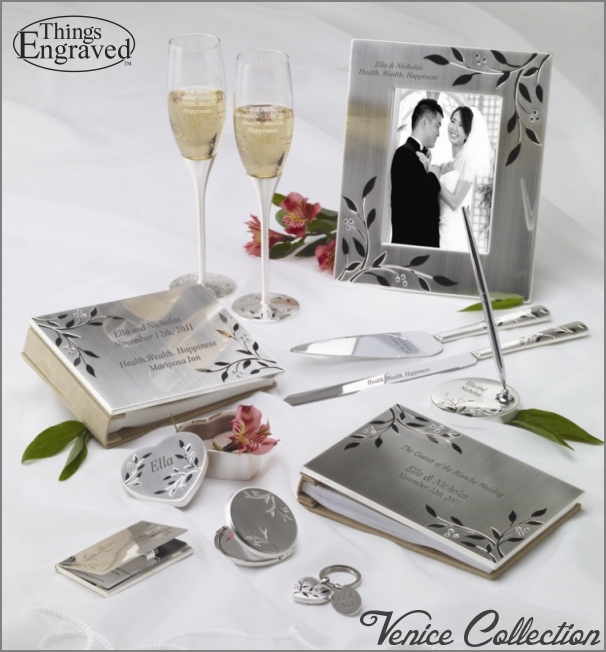 Most items can be personalized with engraving directly onto the pieces with the bride and grooms’ names and wedding date. What a great way to remember your special day. A pretty collection that is ideal for weddings, birthday parties, bridal showers, engagement parties and baby showers! Exquisitely crafted of shimmering silver plate embellished with a sparkling crystal bow that adds sparkle to this entire collection. 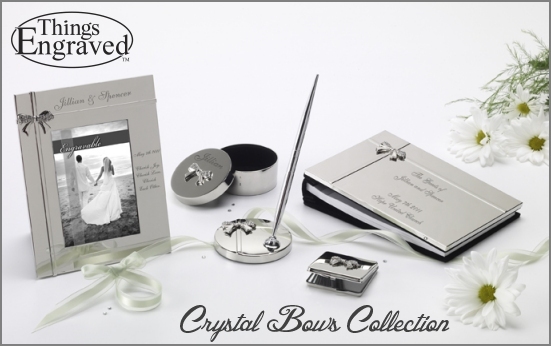 A collection that features a panel or grouping of hearts with crystal detailing on each piece – on a brushed silver background. Very elegant and upscale looking. 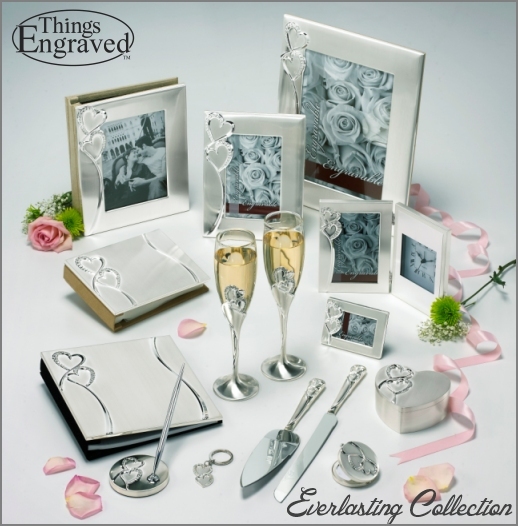 This classic everlasting heart collection will bring true romance to your wedding ceremony and reception. Sophistication, romance and simplicity are all here in the everlasting heart collection. Make the memories last with our Modern Romance collection. Exquisitely crafted of shimmering silver plate embellished with sparkling crystals that dazzle this entire collection. A touch of whimsy and a dose of sheer elegance meet to create this Venice Collection. The sweeping pattern of vines and flowers provide a backdrop with each piece accented with sparkling crystals. With its classic style, this collection feels like a dream come true! Let us help you personalize your wedding collection. Questions? Contact us via email: customerservice@thingsengraved.caor toll-free at 1-800-363-5053.